Are you enjoying the holidays? Or are you in a holi-daze? (Or do you just want some hollandaise?) Last week we had not one, not two, but THREE Thanksgivings here in Houston, and I basically was swimming in a delirious, slap-happy, tofurkey food coma the whole time (jk, I refuse to touch tofurkey with a 99 1/2 foot pole). Sooooooo needless to say I'm on the healthy eating train, with only a couple of restaurant visits for birthdays this week, as well as round two of an epic cookie tasting event (I'm PUMPED). FORTUNATELY (or unfortunately? ), I'm insanely backed up on my Houston restaurant blog posts, so today we're going to talk about pasta! (as I gnaw on a sad, pathetic carrot). It has become a tradition for me to treat my favorite veteran Jon to dinner at the Houston restaurant of his choice on Veterans Day every year. 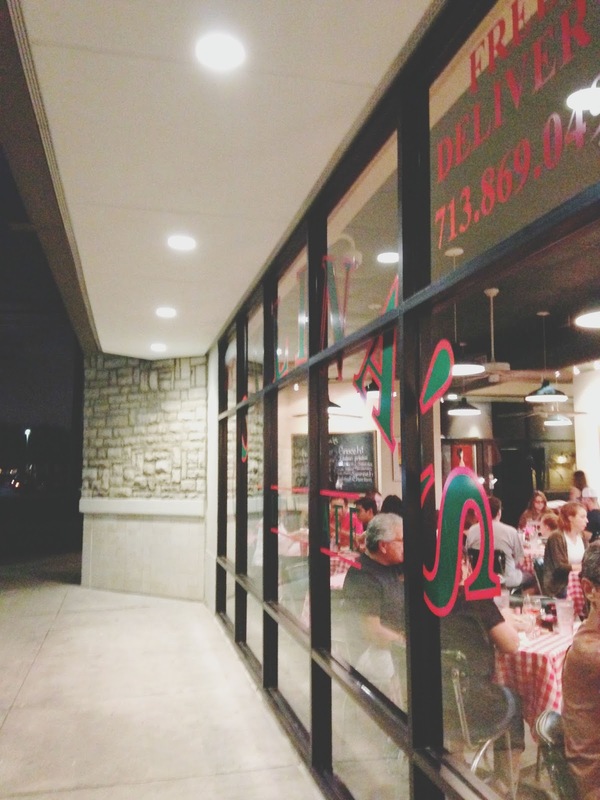 Last year he chose to have dinner at Local Pour, and this year on Veterans Day (yeah yeah yeah, I told you I was behind on posts), we decided to give Collina's Italian Cafe in Houston's Heights neighborhood a try! Before we ordered food, our server popped open a bottle of wine that we brought since Collina's is BYOB and has an insanely cheap corking fee, y'all (something like $3). I seriously love a good BYOB, and on this night we were able to enjoy a bottle we had bought from Grape Creek Vineyards during our trip to Fredericksburg! We also were presented with a basket of complimentary focaccia, which was a little on the dry side, but once dipped in some olive oil and vinegar, we were happy campers! 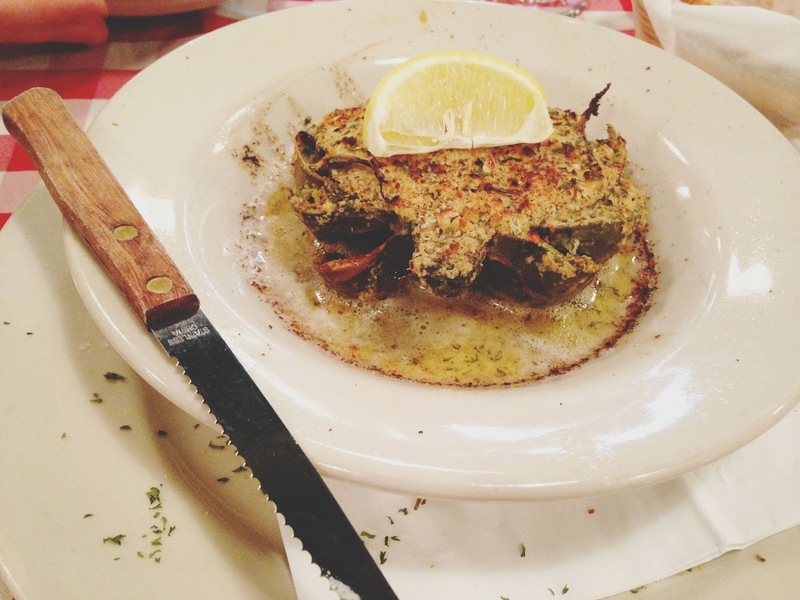 Before ordering our main dishes, we started off with the stuffed artichoke. This was phenomenal, and easily my favorite food item of the evening. The steamed artichoke half - which came out piping hot - was stuffed with artichoke hearts, Italian bread crumbs, and romano cheese, and was topped with garlic butter. All of the ingredients were then baked together to form a wonderfully fragrant and succulent dish. The artichoke was incredibly tender, the bread crumbs were soft, and the garlic butter was bursting with velvety flavor. A few squirts of lemon gave it a wonderful zippy ending! 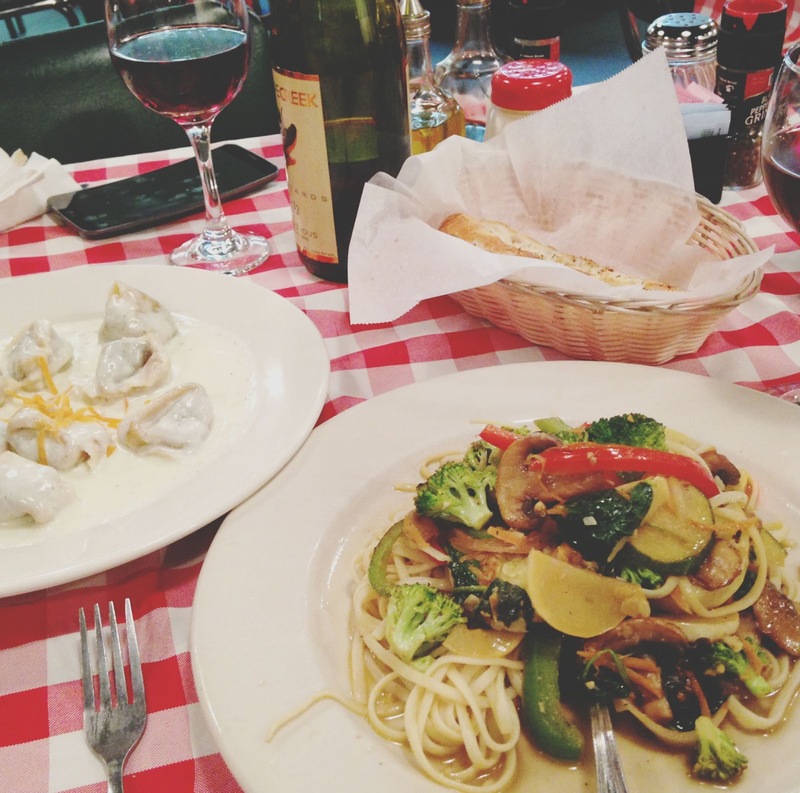 For my main course of food, I ordered the linguini primavera. Even though the noodles were on the thicker side, the olive oil base gave this dish a surprising lightness. And the wide array of vegetables included in the dish (broccoli, zucchini, yellow squash, spinach, onions, mushrooms, and peppers + garlic) was well received by yours truly! After having just enjoyed the gloriously seasoned artichoke symphony though, I did feel this dish could have done well with the inclusion of more spices. 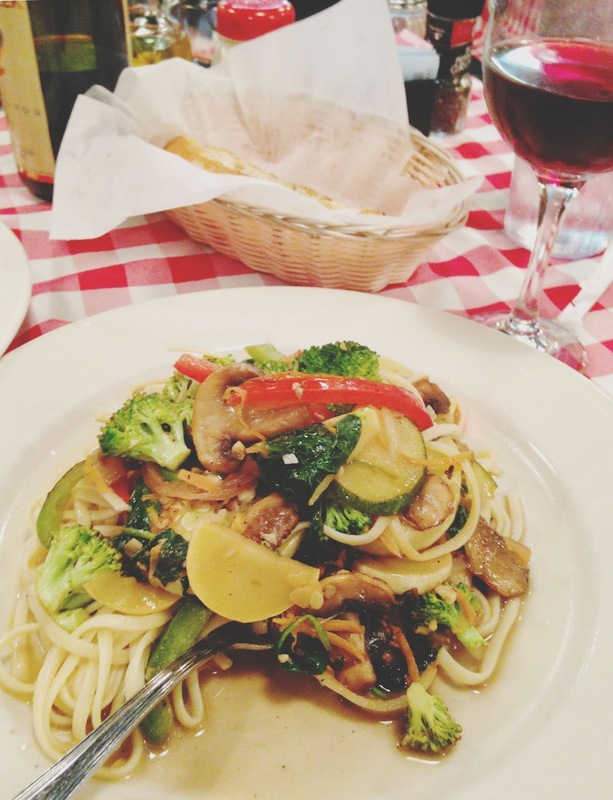 But overall, the linguini primavera is a good choice for a light pasta dish, and one that I would certainly order again. For Jon's entree, he ordered the tortellini. 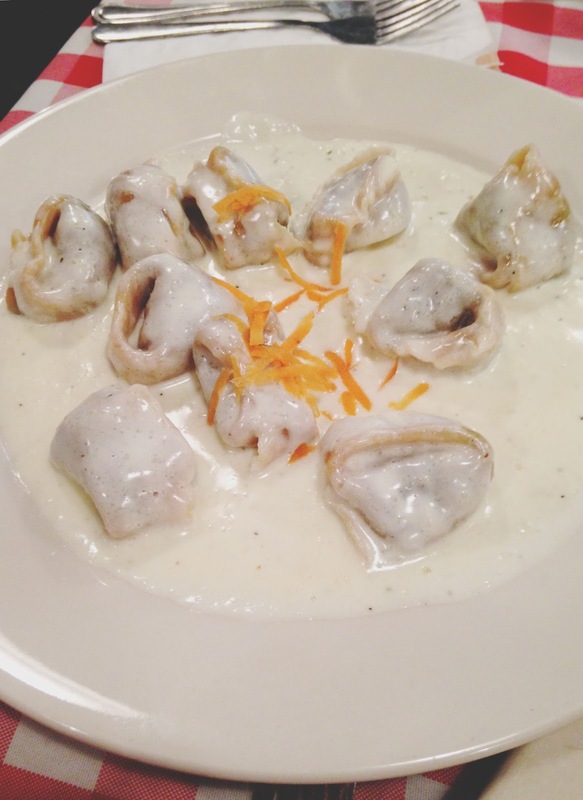 Stuffed with sausage and spinach, and tossed in an alfredo sauce, he definitely enjoyed his creamy, filling tortellini - comfort food at its finest! 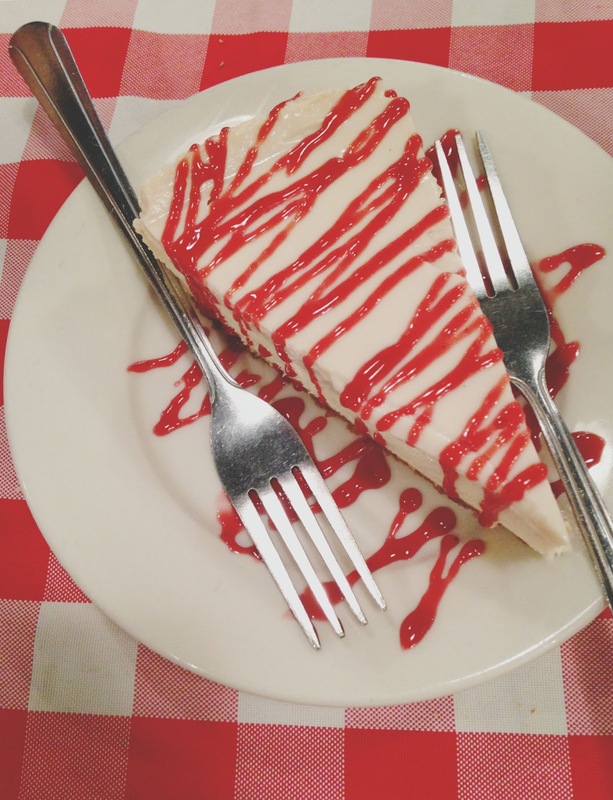 Then we ordered the french vanilla cheesecake with a strawberry topping for dessert. This dense cheesecake was rich, creamy, and playfully textured. The strawberry topping added just the right hint of syrupy sweetness. This cheesecake tasted totally homemade, and we enjoyed every bite! 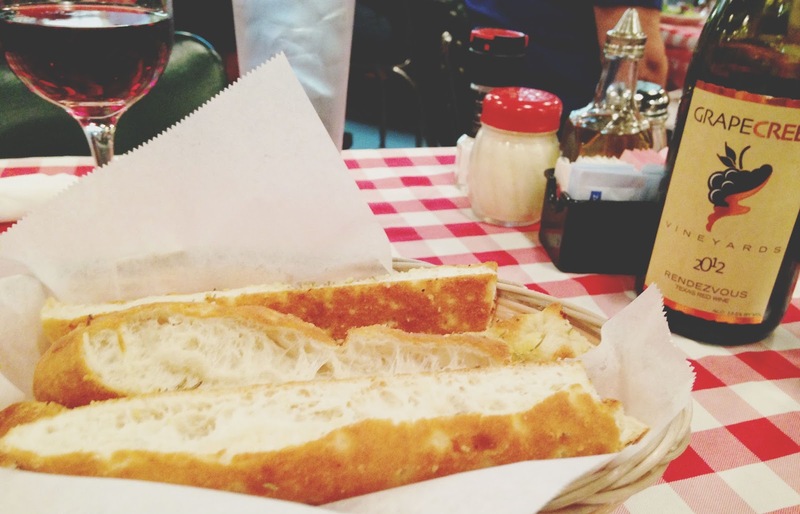 If you're looking to enjoy an inexpensive, no frills Italian restaurant in Houston, look no further than Collina's. 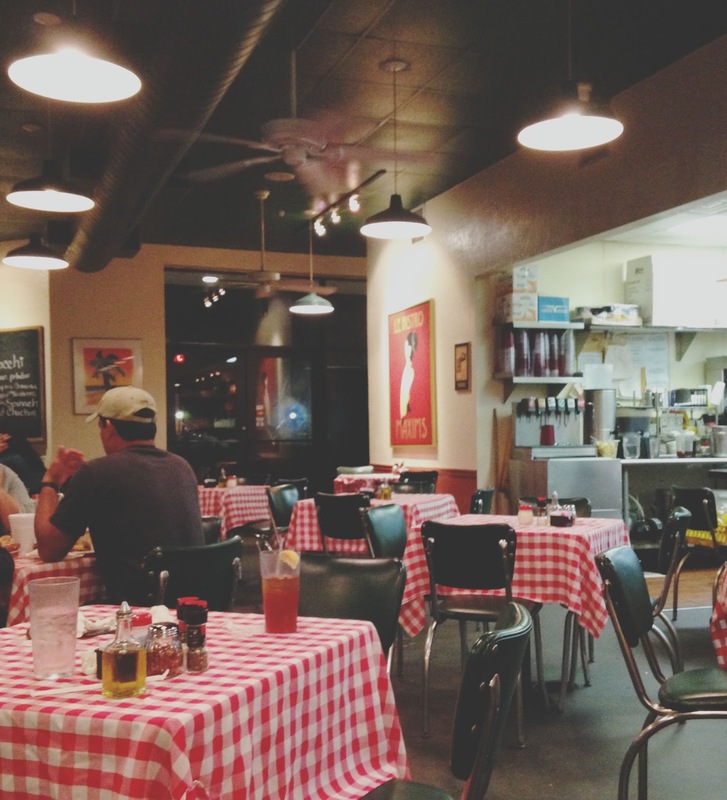 The service is speedy and friendly, and while it's a little brightly lit inside, you will no doubt enjoy the restaurant's fun, checkered tablecloth-lined tables (seriously, can I photograph all of my food on those???). Plus, maybe (okay definitely) most importantly, it's BYOB. In my book, that's always worth a visit!